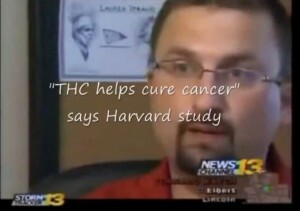 Medical Marijuana Study in Colorado Springs - Maybe the cannabis cream cured Brett Strauss' thyroid cancer. Maybe it didn't. There's no proof either way. All Strauss knows is that in January, tests on five tumors in his neck came back positive for cancer. Two months later, after regularly putting cannabis cream on his neck, the tumors were found to be benign in a post-surgical biopsy. He's become such a believer in the medicinal properties of marijuana that he wants to give people who are terminally ill an affordable way to try it. Beginning Wednesday, he'll pay for people with terminal illnesses to go to Colorado Compassionate Physicians for a medical marijuana recommendation, provide them with free or at-cost medical marijuana if they can't afford it, and even shuttle them to Denver so they can get a waiver for the $90 state fee, if they're eligible. "It's really neat what happened with my cancer, but the real story is giving back and taking care of people who have cancer or AIDS or some other terminal disease," he says. Strauss, 39, is no stranger to medical marijuana. He started using it not long after his first surgery for thyroid cancer in 2007, mostly for pain associated with the operation and for digestive ailments. He then opened a dispensary, and he and his fiancee started an investment company last year to invest in other medical marijuana enterprises. In December, he moved his business, LAKK Investments, into a building near Centennial Boulevard and 30th Street, where Colorado Compassionate Physicians had already opened to serve patients needing medical marijuana recommendations. He soon made his pitch to the doctors to offer free visits for people with life-threatening illnesses. "I think that when he came to our doctors and spoke with them, they just wanted to help," says Vicky Chase, office manager for Colorado Compassionate Physicians. "They want to help the community; they want people to see this isn't a bad thing." Strauss says he has no financial ties to the doctors, doesn't require the patients to come to him for their medications, and won't make money from his offer. In fact, he says, the offer will likely cost him about $80,000 when the business is already operating at a loss. But he believes his investments will eventually pay off, and acknowledges that his gesture might eventually boost his business. "Obviously, we get a benefit out of it — good PR — so hopefully our name grows," says Strauss, who plans to make a similar offer in Denver. "But it's also something we take very seriously. I'm a huge believer." He also hopes that he and the doctors can better track patients who use medical marijuana to provide solid evidence that it helps. "If we start tracking cancer patients — in fact, that's what I'm doing — we can put together something really good and scientific," Strauss says. "I want more stories so we can get real results with it." Strauss makes it clear that his offer isn't a free-for-all for stoners. People must have medical records proving they have a serious illness, and they'll have to undergo an exam. "The doctors are very strict; they don't want people taking advantage of it," says Strauss. "We're looking for really truthful patients." For those who are skeptical that cannabis cream cured Strauss' cancer, you're in good company; his doctor in Denver doesn't believe medical marijuana can go that far. But Dr. Mark Solano confirms the results of both of his patient's biopsies, and backs him on the belief the marijuana has a place in traditional medicine. "In my opinion, it's safer than a lot of prescribed drugs," Solano says. "One of the first people I gave it to was a guy with brain cancer -- he felt it was the only thing that helped with his pain and nausea. But I'm not a marijuana doctor; I'm a family doctor."